Chemical Resistant Mortar, Acid Resistant Mortar. We are among the best manufacturers of chemical resistant mortar as it is mostly used by our customer, is made using best qualitative material, and extensively used for bonding of acid resistant bricks and tiles. Chemical resistant mortar is made by combination of liquid and powder, it should be mixed in proper proportion from workable mortar which after setting and curing of liquid get solid, and give black highly cross linked composites. A mixture of sand, water and cement/lime is used to fix bricks or stones to each other when building walls. 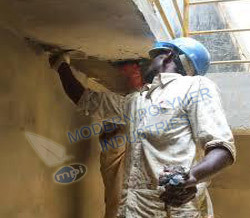 It is also used by adding special chemical resistant mortar to that mixture which is resistant against acid. Acron is also used in this chemical resistant Mortar which when set and curved is highly resistant to corrosive acids and also to organic solvent as aromatic and chlorinated ,ketones solvent, this chemical is highly resistant to salts, greases, detergent, alkali, also resist to organic and inorganic acid at their boiling temperature. Chemical resistant mortar is the ability of a material endures chemical attack, with high chemical resistance has less chance of corrosion and protect against chemical attack. We also supply to chemical lab, pharmaceutical, fertilizer industries using premium quality material. Mortar is attacked by strong oxidizing such as peroxides or nitric acid but is non-resistant to Bromine, chlorine water, chromic acid, water solution.